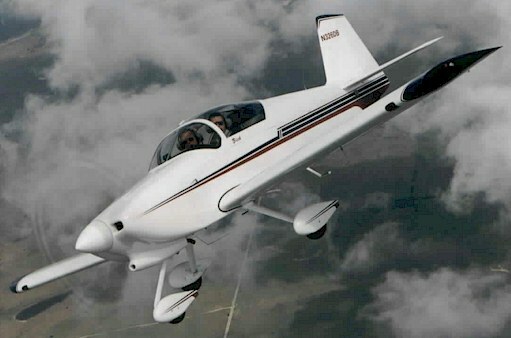 First flight of N326DB was in February, 1999, and the 1600 hour mark was logged on the hobbs during August 2013. The panel was originally designed for day/night VFR, but after enjoying the great cross country capabilities and experiencing several unplanned overnight stays, the panel and pilot were upgraded to be IFR capable. The panel upgrade was done first, then the pilot upgrade. All IFR training and the check-ride was done in N326DB. With the slider canopy, the panel upgrade involved a lot of on-your-back and in-your-face installation activity. As you can see in the photos, the 1999 panel and July 2008 panel look considerably different, and it seems there are always additions or changes being considered. In December 2012, N326DB entered the glass panel world. The EFIS is an Advanced Flight Systems AF-5600. Next to it is an iFly 720. Below the 720 is a Garmin GTN 650, and next to it is the TruTrak DigiFlight II VSGV autopilot. The backup EFIS is a Dynon D6 along side the Dynon D10 engine monitor. The SL30 provides backup navigation as does the Garmin 496. Behind the panel is a NavWorx ADS600-B with the ADSB traffic and weather being displayed on both the AF5600 and the iFly720. N326DB is powered by a Lycoming O-360-A1A with Laser electronic ignition and a Hartzel constant speed propeller. Should you have any questions, my email contact is rflunker at att dot net.